Father Perry Green and his housekeeper, Emily, having spent the morning taking down the Christmas decorations, were carefully wrapping the crib figures in tissue paper and boxing them up for next year. So now, having forcefully crammed the tree back into its original box, it joined the other packages on the landing, waiting for Father Perry to put them in the loft. A few days later, not having visited the loft since moving into his new residence, Perry was keen to tell Emily what he had found up there. The following Saturday, there was jump racing at Ascot on TV. Father Green had come back with the Racing Post and was looking forward to studying the form. However, no sooner than he had summed up the first race, Emily’s brother, Donald, arrived to tidy the garden and rake up and burn the leaves. Perry became restless and felt guilty reading the racing pages while Donald was working, so to ease his conscience, he went out to make himself useful. An hour or so later, with Donald gone and the leaves gently smouldering at the bottom of the garden, Perry thought he had just time to find a few winners. But no, she hadn’t, and after he had made a thorough search, his frustration became evident when, on turning on the TV, he learned that the only horse he had picked out – Mark Pitman’s Hitman – had won at 20-1. That night, while lying in bed, Father Green was disturbed by a scampering in the loft, not much and not often, but just enough to add to his irritating day. Monday morning, after mass, Father Perry went out to buy four mouse-traps and on returning, climbed up into the loft to prime them with Sainsbury’s mature cheddar. The manoeuvre to set the first three traps entailed Perry crawling around on his knees with a torch for ten minutes. But then, with a touch of flair, he planned to set the final trap on the table under the skylight. Approaching the dusty card table his eyes fell upon a half-opened Racing Post. He checked the date – it was Saturday’s! “That’s impossible,” he uttered, then, instinctively, he turned the pages to the Ascot form, and instantly recognised the circle he had drawn around Hitman. Trembling slightly and feeling angry, he tried to reason how the newspaper he couldn’t find on Saturday had now appeared in the loft. After priming the fourth trap, Father Perry descended the ladder still in a state of bewilderment. Then, sitting down heavily on a kitchen chair he told Emily of the mystery. His story, however, carried little credence with her. Although still a little confused, Father Perry knew he hadn’t and didn’t bother to answer. The next day, as soon as Emily went shopping, Perry decided to take another look in the loft. He had told himself it was to see if the traps had bagged a mouse or two, but in truth he was still mystified by the reappearance of his Racing Post. Taking a torch, he checked the first two traps – one tiny mouse. “Looks like they’ve started breeding up here,” he thought. Then, glancing across to where the light partially covered the table, he thought he could dimly make out a figure hunched in the wicker chair. He took a half step and leaned forward, to be sure. Suddenly, the chair creaked and a figure in a military uniform half turned his head to gaze in his direction. Perry recoiled in horror. Half of the man’s face had been shot away, there was no blood, but the face had a grey ghoulish look. Father Green, now transfixed four yards from the vision, spoke out – his faltering voice sounding distant and hollow. The man then got to his feet and slowly raised his arms above his head, as in an act of surrender. Perry, mesmerised, focussed all his attention on the image in an attempt to remember every detail, but then, after six or seven seconds, the man whose uniform Perry now recognised as an army Lieutenant, slowly faded away. Emily had returned laden from the shops and called up for some help to put the groceries away. Perry remained pale and preoccupied. Emily listened, reserving her credence and watching poor Perry’s face while he tried to make sense of what he had just seen. And although they both made an effort to normalise the rest of the day, the thought of the ghostly Lieutenant returned in every quiet moment. The next morning, soon after Perry had gone out for his Racing Post, Emily, courageously pulled down the loft ladder, “To see for myself,” she mused. Then, flashing a torch about her, she saw the dead body of a mouse caught in a trap. Seconds later, she heard a rustle of paper and instinctively thought it was another mouse, or worse still, a rat. But slowly, almost unwillingly, her eyes went to the far end of the loft. And there, under the murky skylight, she saw him. Dignified in appearance and in his mid-thirties, he took no notice of her and carried on reading his newspaper. He neither moved, nor spoke. Then, as he slowly faded before her eyes, she had the strangest feeling that he belonged there. Carefully, she made her way back and down the ladder. Where feeling numb from the experience she flopped into a chair and gazed blankly out of the kitchen window. Slowly, her validation of the vision led her on, and Emily, being Emily she soon became troubled with the responsibility of it. While waiting patiently in the kitchen her mind darted to and fro over her experience, honing it in order to add to Father Green’s first encounter. But where had he got to? When eventually Father Green came through the door, he sensed from Emily’s expression she had been waiting for him. Apologising and explaining that he had dropped in on a sick parishioner, he put the kettle on, while Emily, anxiously at first, told him her story. After a while, when she had run out of things to say and Father Green had nothing more to add, they agreed that a drive and a walk around Victoria Park would help them put things into perspective. Vicky Park, as it is known locally, was bathed in a watery sunlight and sitting on one of the benches by the lake, Father Green and Emily ate their sandwiches and fed the ducks. Oddly, they took on the appearance of a married couple after a disagreement; however, there had been no disagreement, only disbelief. They spoke very little, each in their minds revisiting the appearance of their ghostly lodger. There were very few people in the park that day, but Father Perry commented on the two soldiers taking a stroll. Suddenly, he recalled the childhood memory of the framed blood stained photograph on the mantelpiece of his great aunt Maud. Once she had told him that her husband, Walter, when fatally wounded in the trenches at Mons, had held it up in front of him, before he died. Emily, touched by his sentiments, supported and sympathised with him, until finally, she diverted the topic to her idea that perhaps, the ghostly Lieutenant had lived in the house some years before. Father Green’s enquiries were absorbing. In fact, he was soon spending more time at the Council Offices than at St Joseph’s. Nevertheless, with time put to good effect, he had made steady progress. Apparently, a Mr and Mrs Henderson-Bell had lived there with their son, Roland, until 1913. They then went to live in Canada, leaving Roland behind, until he joined the Army a year later. Further records showed the house as purchased by the Army in 1919. Then, suddenly remembering the ever-growing patter of tiny feet in the loft, Perry made an appointment for the pest exterminator to call. A week later, a ring at the front door brought in Mr Horatio Smallwood, the tall, thin, weasel-like, pest exterminator from the Council. His ID checked, Father Perry welcomed him in, introduced him to Emily then took him upstairs to the loft ladder. Neither Father Perry nor Emily made any mention of their ghostly lodger, and once Mr Smallwood was in the loft, Perry, rather than accompanying him, nervously hovered at the foot of the ladder, praying that the Lieutenant would not put in an appearance. After what had seemed the slowest 20 minutes in Father Perry’s life, Smallwood, having replaced the traps with rat poison, descended. Whereupon, Perry, after scrutinising the weasel’s face for signs of a sighting, gave grateful thanks. Meanwhile, Mr Smallwood washed his hands, asked for a ‘job done’ signature and, before Perry’s heartbeat had returned to normal, was gone. Having as he thought, his obsession with spectre under control, Father Green returned to the loft the following week. Sure enough, there was no sign of mice. Mr Smallwood had told Perry that when the mice ate the poison they would scuttle back to their holes to die. However, the question that had troubled Perry’s mind was silently answered when, under the skylight all that was visible was an empty table and chair. Still requiring proof, he again looked hard, looked away and refocused – nothing. For a moment, he stood there bathing in the relief. Then, torch in hand, he walked across to where the spectre had been. His old Racing Post was still there, but with it, he found a pile of very old newspapers, some racing. He looked at the dates – all were between August and November 1917. The front pages gave reports of the Battle of Passchendaele in Belgium, one newspaper, however, was folded to the racing news. Perry scanned the page – it gave the result of that year’s St Leger and on seeing the name Gay Crusader, he was reminded of that great horse’s Triple Crown victories. When later, he tossed the paper back onto the table, he caught sight at the foot of the wicker chair, what looked like a ladies prayer book. Finally, carefully folded into the back of the prayer book, he found a cutting from the local paper, telling of the bravery at Passchendaele of Lieutenant Roland Henderson-Bell. So, as usual, in household matters, Emily had her way and everything was taken to the local waste disposal. Returning from the tip, Father Perry was forestalled outside his house by a very old man. “I saw you throwing out the last of Roland’s furniture,” he said inquisitively. “You knew him?” replied Perry, stunned. Father Green, however, felt compelled to keep the ladies prayer book and later that month, invited little Tommy Atkins to attend a belated Mass at St Joseph’s for Lieutenant Roland Henderson-Bell and his fiancé, Rosemary. Very few attended, but Emily and the old man went along and sat near the front, where they saw Father Green put Rosemary’s prayer book on a corner of the altar. The Mass progressed through the usual rituals and concluded with the final blessing. Afterwards, outside the church, while Father Green was conversing with his parishioners, he suddenly remembered he had left Rosemary’s prayer book on the altar. Excusing himself he hurried back through the empty church – it had gone. For a moment or two, he felt confused, until believing that Emily must have picked it up. Then, while still a little unsure, he heard the scraping of a chair in the darkened Lady Chapel. Peering through the shadows, he could just make out the veiled outline of a young woman holding the hand of a child in school uniform. With caution, he slowly moved towards the figures, already knowing it was useless, as they became fainter and fainter until, on setting foot inside the Lady Chapel, he was just in time to catch a glimpse of the little girl turning and waving goodbye. Father Green never told anyone of his experience and despite all his efforts, he was unable to recover Rosemary’s prayer book. 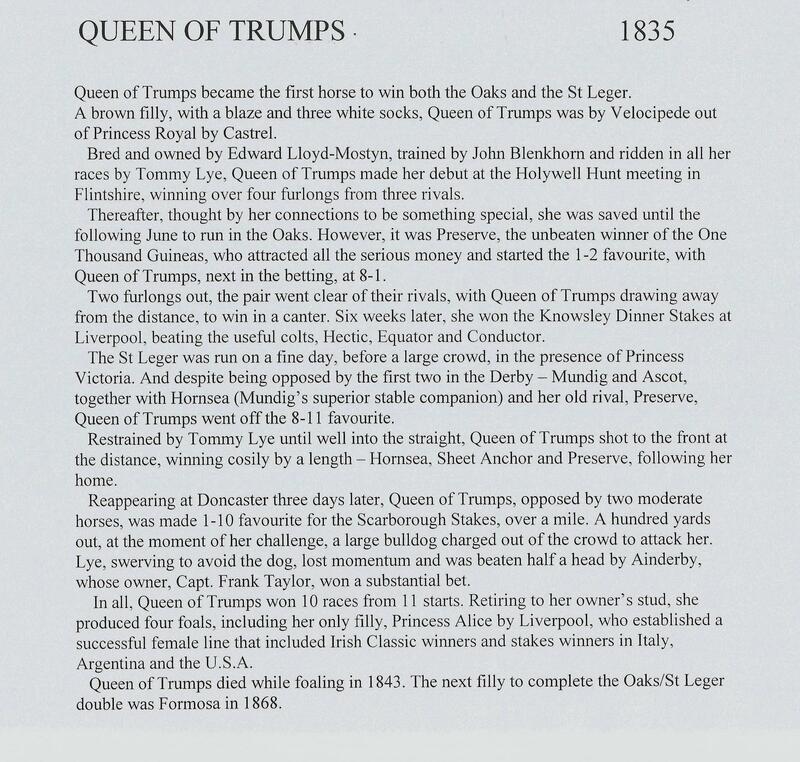 Queen of Trumps was a high class filly that has almost been forgotten. Thirty-four years after Eleanor won the Derby and Oaks, Queen of Trumps was the first filly to win both the Oaks and St Leger. A brown filly born in 1832, she took her name from her dam, Princess Royal, and her granddam Queen of Diamonds. 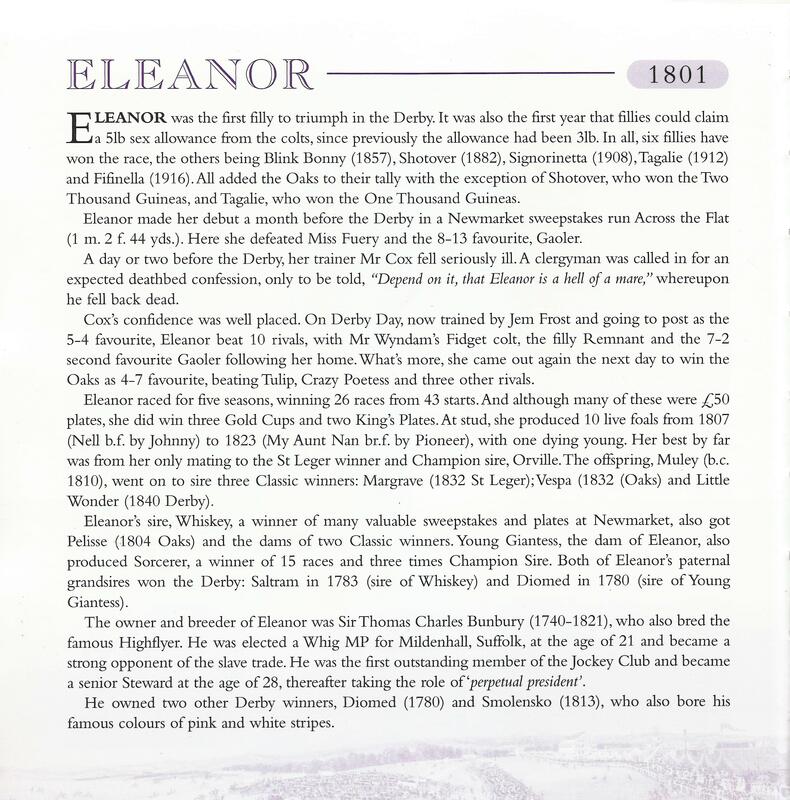 In a career of great resilience she won 10 of her 11 races, her one defeat coming from unpredictable circumstances. I hope that the short essay that follows will bring back a little of her fame. With the F.A. Cup once more upon us, the BBC football website is showing the best 50 goals scored in the competition. High on the list is Tim Buzaglo’s third goal for Woking against West Brom. So needing little encouragement, I have revised my short story from Born to Bet. It was a memorable day for both me and my family, so I hope you enjoy it. “There is no worse feeling than being the slain giant” – and so it came to pass. To put things in perspective, Woking, in their 102 year history, had never beaten a Football League team. At this time, they were playing in one of the three feeder leagues below the Conference, but in the previous rounds of the F.A. Cup had beaten three Conference Clubs successively – Bath City 2-1; Kidderminster 2-1 (after two replays) and finally Merthyr Tydfil 5-1. After the draw for the third round, which sent Woking to West Brom, Geoff Chapple, the Woking manager, was besieged by the press for his comments. All of my family agreed with Chapple, and we readily took the 11-1 odds available for a Woking victory. In fact our optimism ran so high that more than £50 was placed on Woking to win 3-1 at odds of 100-1. At this point, I think it only fair to tell you the source of our enthusiasm. Stan, my father, had loyally watched Woking from 1911, until his death in 1989 (sadly 18 months before this match), and had started my obsession with the Cardinals or Cards, from my first home game at Christmas in 1945. But that explained, we are now driving in cavalcade, red scarves flapping out the windows, to Birmingham – The Hawthorns – West Bromwich. Having parked our car 100 yards from the ground (a considerable achievement) on tarmac an inch under water, we went in search of a toilet, a pub and a sandwich, in that order. After a quick recce, it looked impossible to achieve the treble under one roof. The two pubs we passed had more than a hundred fans standing outside and they seemed to be getting their beer passed through the windows. The supporters’ club-rooms outside the ground needed a membership card, but half a mile away, a locked up garage allowed us to buy some snacks through a security hatch. As for the toilets, well, we managed with a little improvisation. Forty minutes or so before kick-off, we climbed the steps to the away-end terrace turnstiles. Here we were searched for weapons and alcohol (usual practice), but whilst my family and friends were allowed to proceed, I was taken to one side and questioned about my hip flask of gin (a constant companion at all sporting events and funerals). “For medicinal purposes is it sir?” A bean-pole of a policeman going on 19 towered above me. “Y-y-yes, it calms me down,” I said feebly. To say that policeman, or more directly the flask of gin, was crucial to my afternoon might be pushing it, but I was deeply grateful for its soothing qualities at times of intense stress. Our allotted enclosure (from the far left of the goal to the corner flag), had not got the best view of the pitch, but the 5,000 or more Woking fans wearing red and white Santa hats, scarves and carrying banners and flags, made that corner of The Hawthorns their own. Football fans amongst you will appreciate our novel chants of “Give us a Wubbleyou,” “Woking, Woking, boing, boing,” (accompanied by manic synchronised leaping) and “When the Cards go steeeeeaming in,” (When the Saints Go Marching in). But for all that, we were one down at half-time; Colin West heading the Baggies ahead from a Craig Shakespeare corner. By now it was bitterly cold and a sharp wind swirled around our corner of the ground – time for another gin. The strains of the pop instrumental “The Liquidator” welcomed the teams back on the pitch. Woking were kicking towards us this half – dare we hope? For me and those loyal 5,000, the next 14 minutes and the name of Tim Buzaglo will probably be among the things that flash before our eyes when we are about to die. Buzaglo’s hat-trick kicked off in the 59th minute with a precision left foot curler. six minutes later, he ran through two defenders and the goalkeeper, to head Woking into the lead, then, on 72 minutes, he sealed his place in history with a diagonal left-foot drive. West Brom were truly in tatters, my flask was drained and rumour’s of the Church family’s correct score coup began to circulate. But it was not to be. Terry Worsfold, an 87th minute substitute for Woking, who incidentally lived in the same road as my Dad, scored a minute later – 4-1. Suddenly, reality replaced our suspended belief; we really were going to win. Wildly abandoned singing, dancing and laughter lit up our corner of the stadium. But, at the other end, there were very different emotions. Disillusionment, discontent and anarchy broke out from their Birmingham Road End. The Brommie fans’ chants grew louder and louder, so loud in fact, that no one noticed or cared that Darren Bradley had made it 4-2 a minute from time. I had never before, or since, witnessed scenes like those that followed. On the final whistle, the West Brom fans invaded the pitch, not to cause trouble, but to congratulate the Woking players and their fans, especially Tim Buzaglo, who they lifted up on their shoulders and paraded in front of the stands to taunt their board of directors. From these amazing scenes we left the terraces and made our way back to the car. Moving bumper to bumper along the road that runs parallel to the stadium, our red scarves trailing triumphantly out of the windows, we were suddenly surrounded by West Brom fans banging on our windows. Fearing the worst, I cautiously wound down mine an inch. And so we did, and wore them as trophies for the rest of the season. After the match, it was reported that up to 4,000 WBA fans took part in a 40 minute pitch demonstration, calling for the board and their team manager, Brian Talbot, to be sacked. There was no violence. Talbot was sacked within 24 hours. POSTSCRIPT: “Are you West Brom in disguise?” So sang the Woking fans at Everton in the fourth round of the F.A. Cup. But sadly, here the dream ended. Woking going down 1-0, before a crowd of 34,724, which included over 10,000 Woking supporters. Sir Charles Bunbury, trained by Jem Frost and ridden by John Saunders. On the day that the weathermen had predicted violent storms and flash flooding over Epsom Downs, Australia, who had previously drifted in the market due to the expected downpour, stormed home in glorious sunshine. 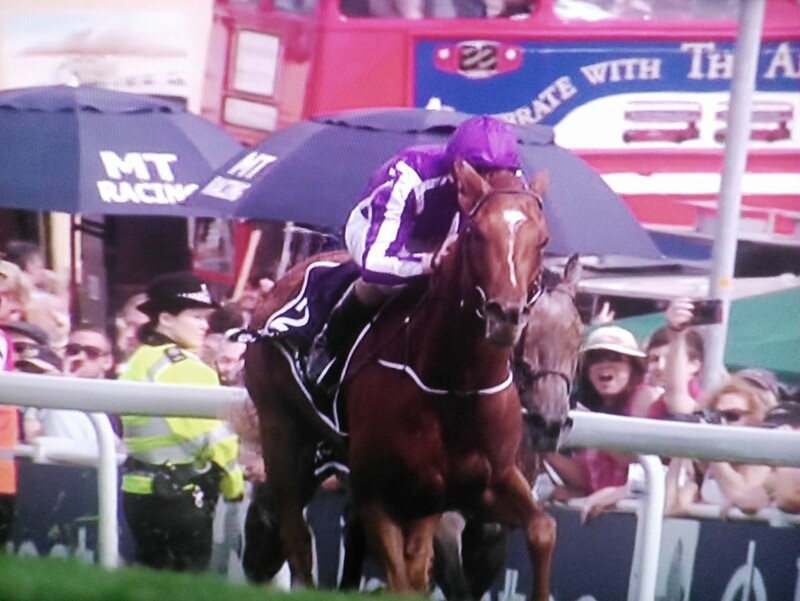 Bred in the purple by the 19th Earl of Derby, Australia, was by a Derby winner (Galileo 2001), out of an Oaks winner (Ouija Board 2004). 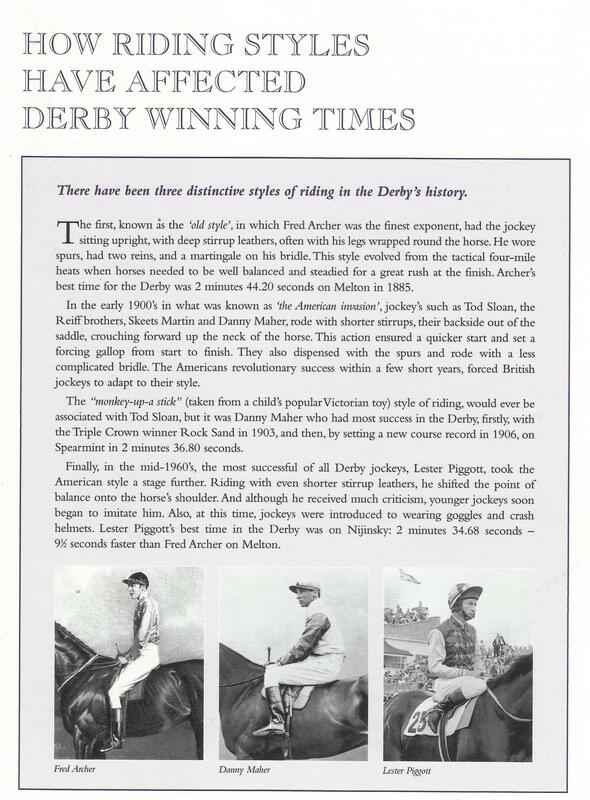 But the history did not stop there; Aidan O’Brien became the first trainer to win three consecutive Derby’s and the owners, their fourth on the trot. Of the 16 that went to post, the main players were Australia, a runaway winner of a one mile, Group 3 at Leopardstown in September and a close-up third in the Two Thousand Guineas; Kingston Hill, winner of the Racing Post Trophy and a close eighth in the Guineas; Geoffrey Chaucer, winner of the Derrinstown Stud Derby Trial Stakes; and the second and third in the Dante Stakes, Arod and True Story, the latter the foremost of the Godolphin trio and ridden by Kieren Fallon. When the field settled, Our Channel and Kingfisher took them along, closely followed by Kingston Hill, with Australia in mid-field. The order remained the same until Tattenham Corner, when the front two extended their lead to four lengths . Meanwhile, Joseph O’Brien brought Australia up the outside and, between the three and the two furlong pole, challenged Kingston Hill for the lead, as Our Channel and Kingfisher fell away. Soon after, Australia asserted with a burst of speed, to win by one and a quarter lengths, from the gallant Kingston Hill, with Romsdal, who ran well throughout, staying on to be third, a further three and a quarter lengths away. 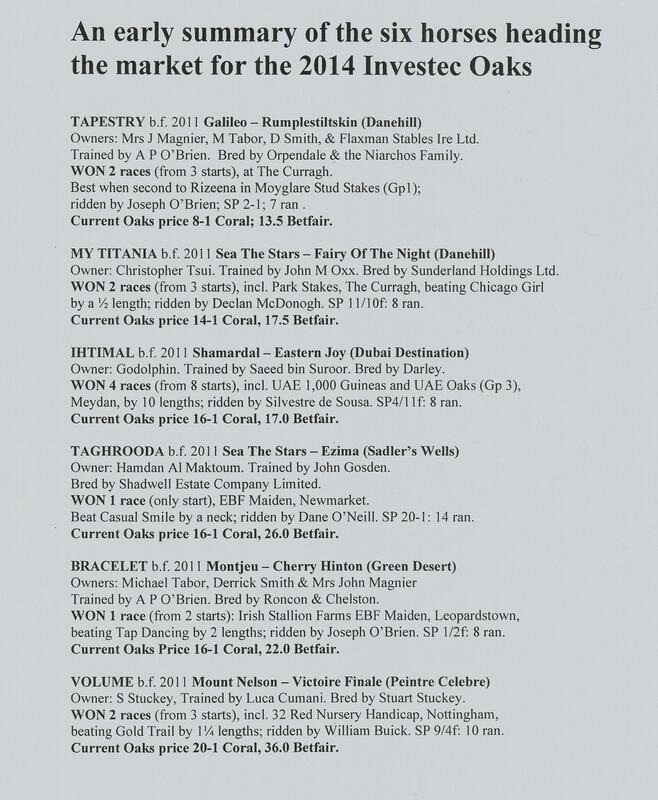 A glance at the records confirm that seven winners in the last decade were sired by, either Montjeu (died 2012), or Galileo, standing at Coolmore in Ireland. 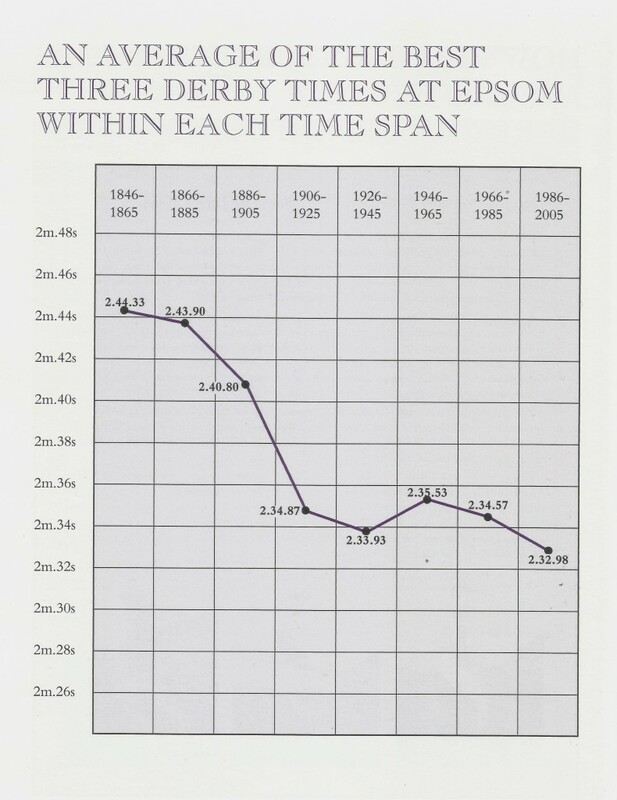 I made a study of the Derby winning times. Those pages follow, together with an update from the winning times 2007-2013. The average of the best three times in the span 2006-2013 is 2min 33.26 sec, the second fastest period in the history of the race. The Prince’s Stand dates in its present form from 1879, when the original Regency stand, built c1784, was altered and enlarged. Used by the Prince of Wales, later King George IV, it housed the royal party celebrations when the Prince won the Derby with Sir Thomas in 1788. Up until 1829, it was the only permanent building on the Downs, although by 1831, when the Princess Victoria visited Epsom, it was struggling to keep the royal entourage comfortably ensconced. In 1940, soon after the outbreak of war, racing at Epsom was abandoned for the duration and given over to the military; the Prince’s Stand was then commandeered as the Officers Mess. 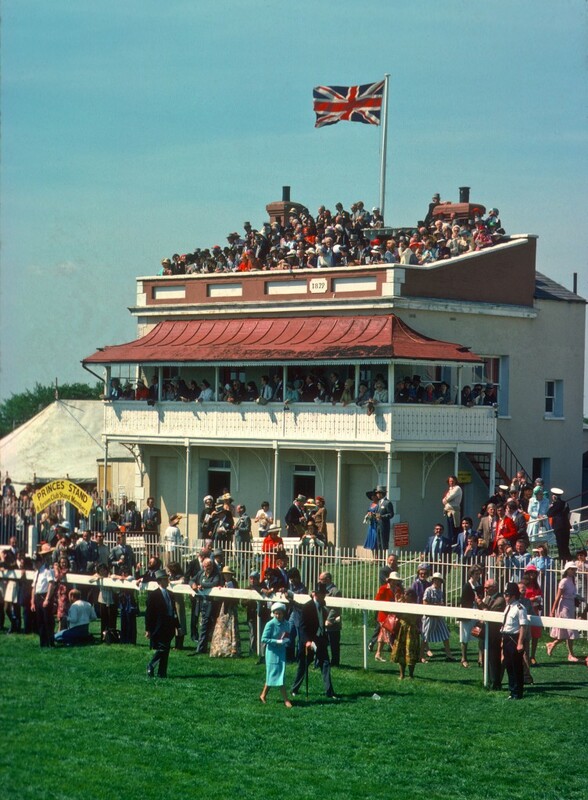 In 1979, as part of the celebrations for Derby 200, the Prince’s Stand was extensively refurbished and, it’s continued use links together more than 22 decades of history. The Great Metropolitan and City and Suburban Handicaps, now run at the one-day, Spring Meeting, were the very first two races to be sponsored. While the Epsom management struggled to put up enough prizemoney, Samuel Beeton, a publican in Milk Street, opened a subscription for the first handicap and then, persuaded his fellow publicans in Fleet Street to follow suit. At that time, many London pubs served both as betting shops and ale-houses. “The Great Met,” as it became known, was first run in 1846, and won by Chamois (3-5st-7lb), 29 ran. The distance was 2m 2f, until 1985, when it was changed to 1m 4f. The City and Suburban, run over 1m 2f, followed in 1851, and was first won by Elthiron (5-8st-5lb), 16 ran. 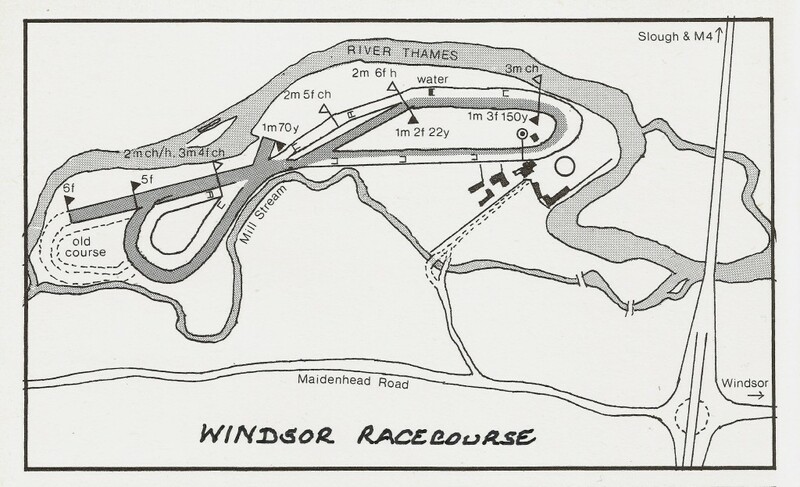 Subscriptions for the race were raised from pubs in the City of London, stretching out to the suburbs – hence its name. 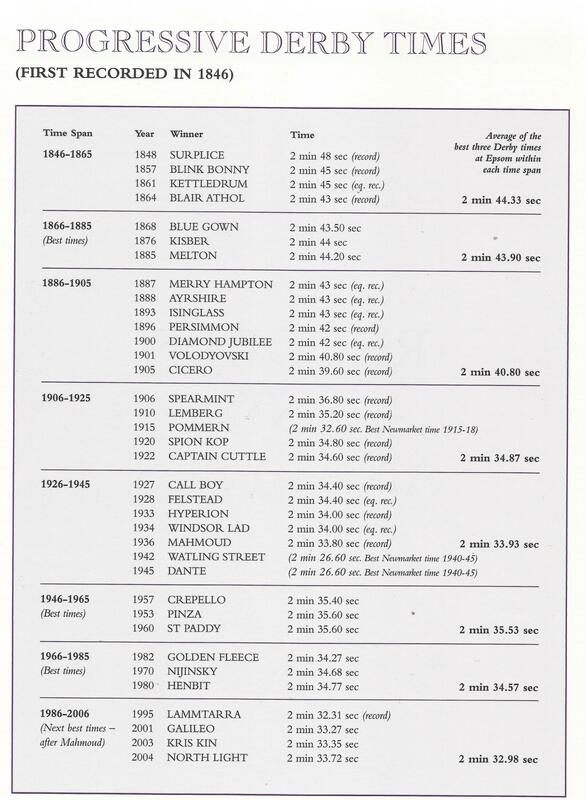 Incidentally, the first occasion the photo-finish camera was used in Great Britain, was at Epsom, on 22 April 1947, to determine the placings for The Great Metropolitan Handicap. Star Song (Doug Smith), winning by a length, with Parhelion (Eph Smith), second, beating Salubrious (Bill Rickaby), by a head. Following my posting of the early Derby contenders, I have listed below six of the best in the Oaks line up – a far more open affair than this years Derby. To set the standard, I have featured below, the 2004 winner, Ouija Board, who incidentally, is the dam of the current Derby favourite Australia. From the list that follows you will see that Godolphin’s Ihtimal is the most experienced, winning four of his eight races, including the UAE 1,000 Guineas and the UAE Oaks. However, eight races for a Classic-bound two-year-old might not convince the purists. My Titania, by Sea The Stars, looks a more serious contender – trained by John Oxx and winner of the Park Stakes at The Curragh. While Tapestry, by Galileo, is trained by Aidan O’Brien and has been a long time favourite for the race, since finishing second to Rizeena in the Group 1, Moyglare Stakes. Bracelet, by Montjeu and Taghrooda, by Sea The Stars, have both won their Maidens, while Luca Cumani’s Volume comes via a competitive Nottingham Nursery. No doubt, in such an open year, others will enter the picture, but until then, the following list will give you a headstart. Uncle Percy was a remarkably jovial fellow, despite having a leg amputated after the Battle of the Somme, and then later, losing the sight of one eye in curious incident with a magpie. The latter, finally putting an end to his career as a watchmaker. Percy was married to Mitzie, a small vivacious lady, now grown buxom with age. She had often recalled her life as a chorus girl in the music halls, before she became part of a novelty act – plates on bamboo poles and that sort of thing – often footing the bill at the Kingston Empire. One Sunday, back in the mid-sixties, my wife Pat and I took a trip on our Lambretta scooter to the Devil’s Punchbowl – a well-known beauty spot near Hindhead in Surrey. And, it was whilst hiking near the top ridge I remembered that Uncle Percy, one of my maternal grandmother’s seven brothers, lived on the rim of the Punchbowl. Eventually, for the path was both narrow and rough, we spotted a bungalow above us. Venturing forth, I recognised Percy (eye-patch and limp) out in the garden. I called out my name and introduced him to Pat. Very soon, we were seated around the fireplace with mugs of hot tea and buttered scones. Percy asking after his younger sister, Alicia Margaret (Nan), who lived with my parents in the centre of Woking, while Mitzie took over Pat with questions about our new house in St Johns and our scooter, which we had parked a little way off. Our lively conversations, however, were punctuated by another voice – that of Henry, a large white parrot with a plumed head, who had settled on the back of Percy’s chair. Alas, his profanities overtook our pleasantries and Mitzie swiftly returned him to his cage. Later, we bade farewell and promised to keep in touch. However, nothing ever came of it – that was, until two years later, when one night, quite late, I had a call from Percy. “Yes,” I answered cautiously, wondering what was to come. “Yes, sounds exciting,” I replied. “O.K., meet me in the Members Bar under the grandstand before racing. That Saturday, with Pat heavily pregnant with our second child, Sarah, and me a non-driver, I set out on the convoluted journey from Woking to Windsor racecourse – two trains, sometimes an hour apart, and a boat trip. The latter, a tourist attraction, which had the ill-founded reputation for being quicker than the local bus. Whilst devouring the sausage sandwiches, Percy revealed he had recently sold a prize antique grandfather clock and, as yet, had not been able to bank the £1,500 in cash! Just before three o’clock, Percy went off in search of a price against Kitty’s Grey in the five-furlong Maiden. He returned saying he had just had a small bet, but I noticed, meanwhile, the price had gone from 2-1 to 7-4. In the ensuing delay, bookmakers took the opportunity to make a little extra or, as they would suggest, to allow punters to hedge their bets. Percy felt he was now between ‘the devil and the deep blue sea’ – he could back Hen-Pecked and so negate most of his winnings, or do nothing and hope the result didn’t reduce his intended stake on Watchman. As the runners for the next race were going down, a crackly Tanoy interrupted with authority, “Objection sustained, objection sustained……first Kitty’s Grey, second Hen-Pecked, third…..the rest was drowned by Percy’s cheering – more than usual for “Just a small bet,” I thought. Time for a celebratory drink, before Watchman’s race at four o‘clock. Percy, flushed with excitement, insisted we both downed double whiskies, before dividing up his grand into two five-hundreds for us to bet on Watchman. I knew there were only five runners, but the odds of 8-13 were disappointing; worst still, by the time we went forward, it had gone to 4-7. However, we got on at opposite ends of the line at exactly the same time to get £285 to £500 twice. The race was a complete joy. After settling Watchman down, Lewis took him to the front and won in a canter by six lengths. From then on, we planned to spend the rest of the afternoon in the bar, rather joyously, I’d hoped, but strangely, not so. “Perhaps I can help,” I feebly suggested, “I’ll, I’ll, h-hold him up for a w-while,” I stammered. But Percy was in full flight now, leaving me to choose whether to hold-up or not to hold-up – that was the question? Out of family loyalty to Percy, I made the effort and while Alec was furtively scanning the room for Percy, I approached. “Err Watchman, Geoff Lewis up,” he replied. “What price was that?” I persisted. Alec, now looking agitated, ignored me, until…. Still giving Percy a chance to get away, I replied, “Was that one eye patch or two? Alec looked angry and I thought at one point he was going to hit me, but he didn’t. “Bloody hell,” so that’s why Percy wanted to scarper. Even so, a ton at 4-7 wasn’t going to hurt him, but, if Kitty’s Grey was part of the deal, then that was a different kettle. Meanwhile, Geoff Lewis continued his rich vein of form winning the next race at 6-1 and so, landing me three S.P. doubles. But was that another of Alec’s tips, I wondered? Needing to allow time for the situation to resolve, I went out to the paddock and then watched a race from the terraces. When I returned to the Members Bar, Percy had got there before me and, had continued with the double whiskies. Strange as it may seem, this turned out to be a blessing for all concerned. For soon after insisting that he drove me back to Woking, Percy slumped forward onto the bar and passed out. At that moment, I caught sight of Alec enquiring at the other end of the bar. Thinking quickly, I called him over. He surely couldn’t put the finger on Percy in this state and, it might defuse an ugly confrontation. “Is he alright?” Alec enquired, looking down at an unconscious Percy. I gave him a look of disbelief. “We’ve got to get him home,” I said. “You knew him after all then,” Alec said, revising his take on the situation. “Who, Percy?” I retorted, still hoping to buy some time. In the end, I came clean with Alec and to my surprise, he came clean with me. “But why was he worried about paying odds to a £100?” I asked. I helped Alec drag Percy back to his car. Percy suspended between us with his arms drooped round our necks. I was in no position to argue, but I dare not tell Alec, that not only had Percy won around one and a half grand, but he also had his pockets stuffed with the fifteen hundred that Alec had given him for the clock! The following day, I telephoned Mitzie to find out if Percy got back all right. “Oh he’s fine, thankyou.” she said breezily, “He’s out celebrating with Alec at the moment,” and put the phone down. Celebrating, celebrating – no mention of the clock – and sadly, there never was, because to this day, I never, saw or heard from either Percy, Alec, or Mitzie, ever again.